Quality Magazine have published an article about using benchtop mechanical testing to assess materials in the automotive industry, saving time and money. Full scale tests are often used to test the frictional behaviour of materials, to compare their wear characteristics, friction curve and more. For example, in clutch testing, this data is used to calculate the functional lifetime and effectiveness of components. Developing new materials in the automotive industry can be costly and time consuming. Rather than performing full scale tests, benchtop testing is a way to assess materials more quickly, with simulated conditions that do not require the fabrication of full scale components. 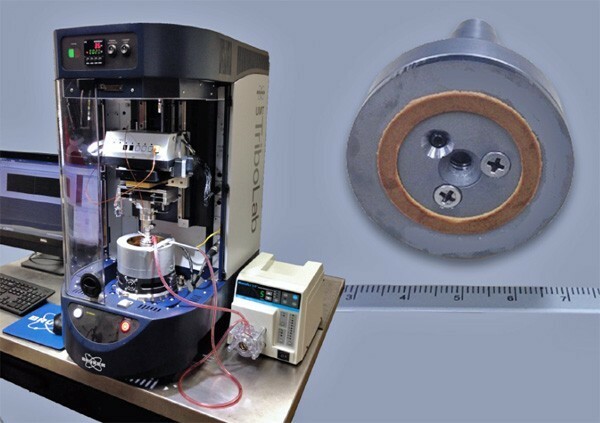 In addition to the contact pressure, sliding speed and temperature, a minimum contact size is necessary for benchtop friction material testing. This is due to the non-homogeneous nature of clutch materials. All constituents must be taken into account, including the reservoir and channeling effect of the surface roughness and porosity. 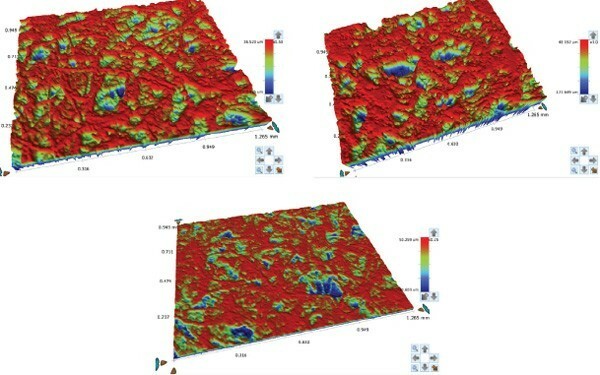 This variation in surface texture is evident in the 3D topographic images below. 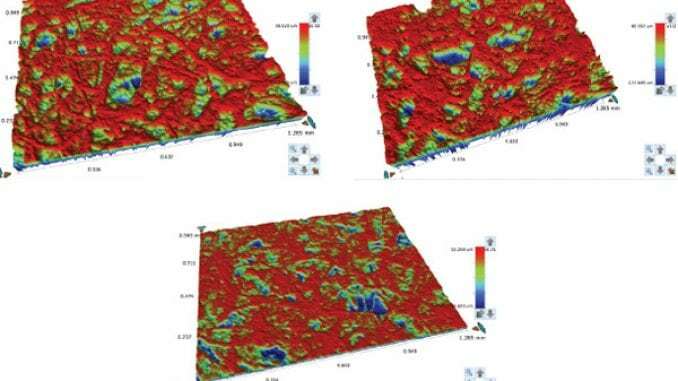 These images were taken using a Bruker white light interferometer (WLI). The contact area needs to be large enough to reflect the effect of the inhomogeneity and the surface roughness on the friction. Duration of clutch material engagement at a given speed. Rate of application of the full contact pressure. Dwell time between test conditions. Recirculation and filtering of the ATF between clutch material changes. 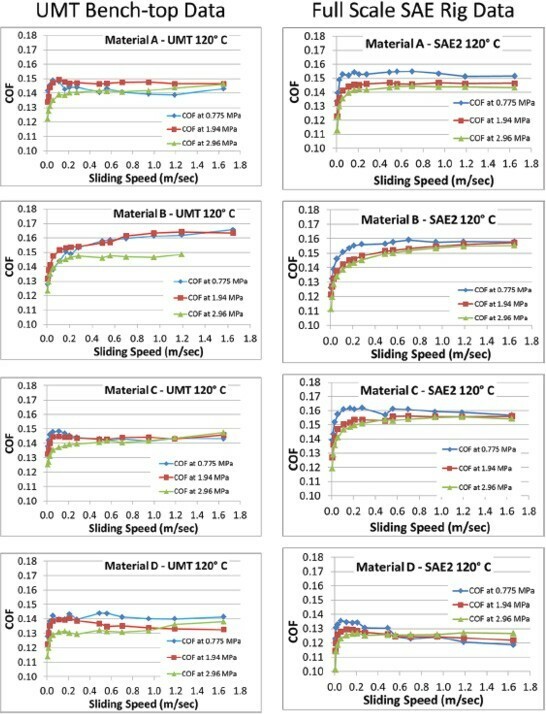 The charts below compare the results of benchtop tests performed using the UMT TriboLab with results from a full-scale test rig. The step-speed clutch material tests were conducted at 120°C on both systems. These results show good agreement in the simulated tests, for relative rankings, curve shape as a function of velocity and the magnitude of the COF for each material. In this example. the positive slope of the COF versus velocity curve for Material B show that it is a viable choice for the clutch design modeling. By applying the equivalent contact stress, acceleration, sliding speeds, fluid conditions and temperature as full-scale clutch testing rigs, benchtop screening is an ideal way to simulate full scale tests. This speeds up decision making and reduces the costs of down-selecting materials for final proof in full scale clutch rig testing.